In the Sandhills, wind makes water. Beneath these sandy hills, there is a vast ocean of water. 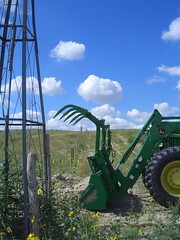 The Ogallala Aquifer. Windmills pump the water up for the cattle to drink. 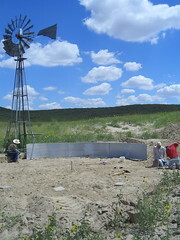 Several new windmills were put in on the ranch this summer. Drilling wells is relatively simple here, because there is water underneath us everywhere, sometimes only 20 feet below the surface. 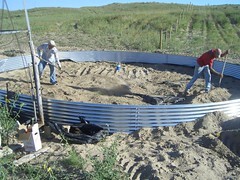 But each well needs a tank to hold the water - and building tanks is a bit more laborious. 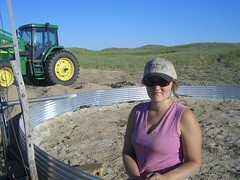 I went out to help put a new tank in yesterday - the farthest well from the homeplace. It wasn't the hottest day, but there was hardly any breeze, and not a scrap of shade to be found, so there wasn't much relief. 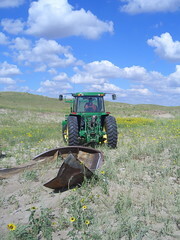 The first task was for the tractor: tearing out the old tank and clearing a spot for the new one. Each thirty-foot tank comes in twelve sections. 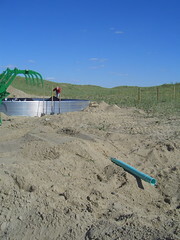 Each joint is positioned on a block, all of which are painstaking leveled, as it is important that the tank be level. The leveling process was actually pretty ingenious: using the fact that the water level in a hose of water will be of equal height on both ends, the height of each block was matched to a control height, using a clear hose of colored water. 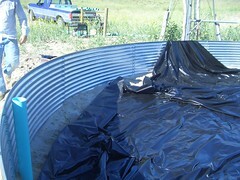 The tank sections were edged with a strip of super-sticky watertight goo and then loosely bolted together. 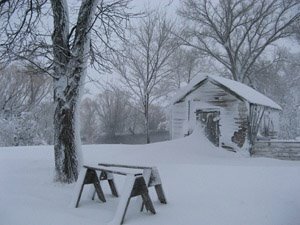 Once all twelve sections were in, the generator was fired up to power the drill. Once all the bolts were tight, we double-checked our levels and made a few adjustments. Next, dirt was dumped in and smoothed out, to bring the ground level up to the bottom of the tank. Bentonite was spread over the dirt floor of the tank. Bentonite helps expedite the formation of a mucky impermeable layer of slime. 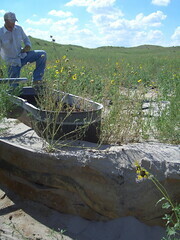 The overflow pipe was set in, so that water wouldn't spill over the edge and erode the 'bank' around the tank. 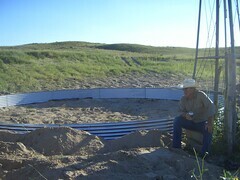 Then giant single sheet of plastic was laid down, to keep the water from disappearing down through the sand, until the Bentonite sludge forms. 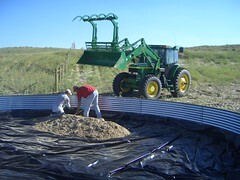 And then the dirt started coming in - to keep the plastic from getting damaged by cattle tromping around in the tank. 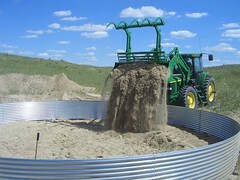 About six inches of sand was spread around and then more Bentonite was mixed in. Meanwhile, the tank was banked in all around with the loader-tractor. Ta-Da! Time for a beer. Great picture of George. Good picture of ol Johnstone as well. It amazes me how different the daily routine of you and yours and my Wall Street life. Look at the sky you're under!! Its so blue! I don't think this project is in "Built it Better Yourself."